Fellows Emilianne Lewis and Joseph Reyes Decorating The Geary. 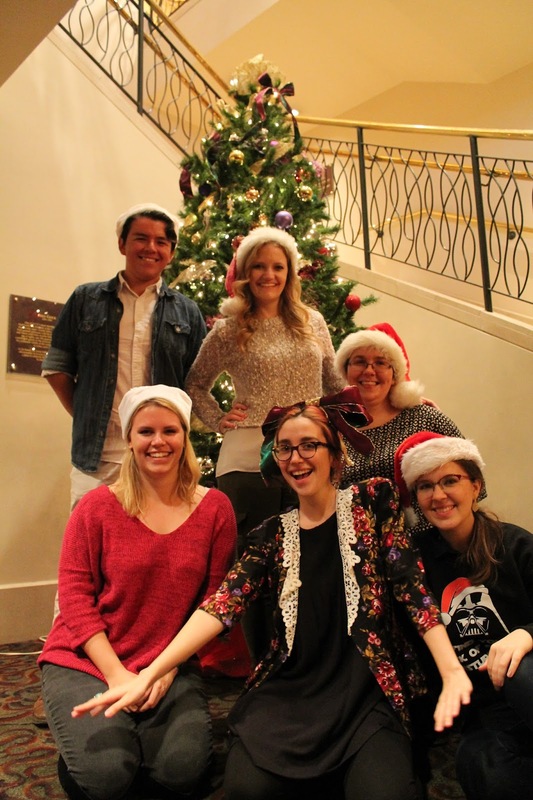 Today, some of A.C.T.’s 2016–17 fellows participated in one of the most cherished rituals in the company’s calendar—decorating The Geary Theater for the holiday season and A.C.T.’s production of A Christmas Carol. After fueling up on pastries and hot cocoa, fellows Emilianne Lewis, Karen Loccisano, Julia Ludwig, Joseph Reyes, Elspeth Sweatman, and Marcella Toronto donned their holiday hats, turned on the carols, and set to work hanging wreaths, placing garlands, and untangling yards and yards of lights. Two hours later, The Geary had been transformed into a winter wonderland that even Scrooge would love. From Fred's Bar to the lobby to the Sky Bar, not an inch was left without a little holiday sparkle. 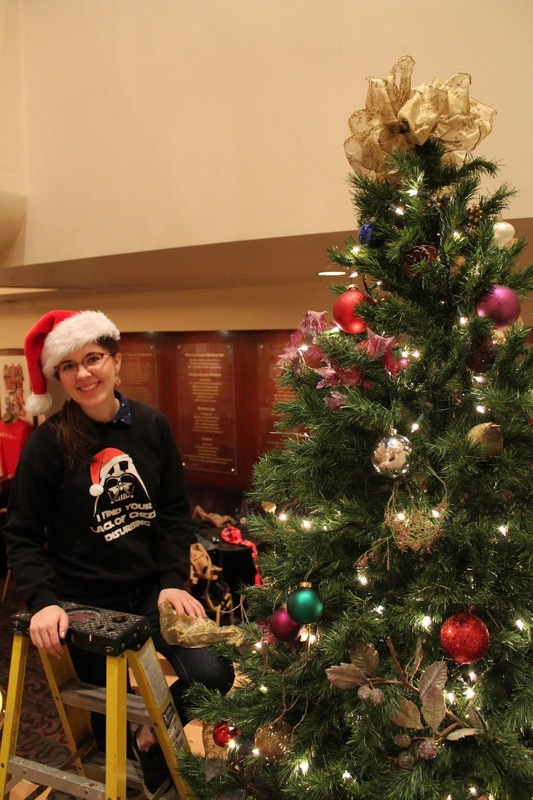 "Decorating The Geary this morning with the other fellows definitely brightened my day and got me into the holiday spirit," says Special Events Fellow Julia Ludwig. Fellow Marcella Toronto Decorating the Tree. This tradition of decorating The Geary falls at a perfect time in the fellowship. "We've become close friends over the past few months in this new and exciting city, and this was the perfect way to bring us together in the midst of our fellowship," says Ludwig. "It's a fun way to celebrate the holiday season with our little fellow family," agrees Graphics Fellow Karen Loccisano. "At A.C.T., we have the opportunity to be part of a community. I really felt that this morning as we decked the halls of The Geary," says Academic Programs Fellow Marcella Toronto. “We'll be able to look at The Geary and know that we helped get it ready for all of our patrons who are coming to celebrate the holidays with us,” says Marketing and PR Fellow Emilianne Lewis. Some of A.C.T. 's 2016–17 Fellows. Photo by Amy Hand. Come celebrate the holidays with us! A.C.T.’s production of A Christmas Carol begins performances November 25. Click here to purchase tickets through our website.